Round 4 of the Continental Tire SportsCar Challenge (CTSC) took place at Watkins Glen International in New York. 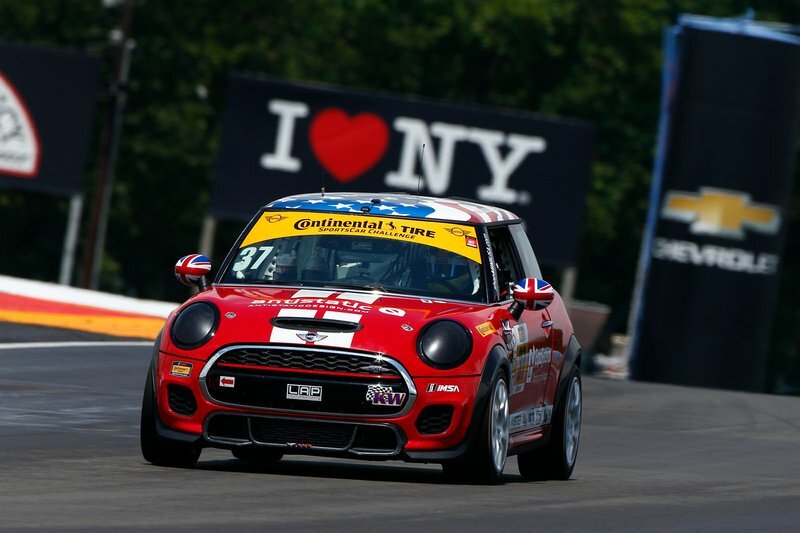 The Continental Tire 120 at the Glen was a two hour event that the MINI JCW Team has had previous good runs at. Derek Jones followed up last year’s pole position at Watkins Glen with a second place qualifying effort this time out. This event would also be the first for a fourth MINI JCW, the 47 of Team Octane. 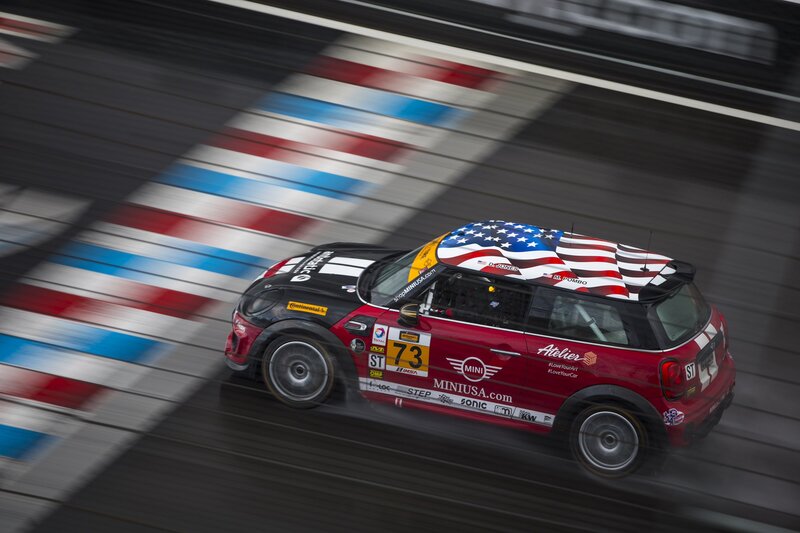 With four cars on the track and wet conditions in the forecast things were setting up nicely for a strong run by MINI. What started as a promising day quickly went south. Immediately when the green flag dropped the 73 with Derek Jones behind the wheel fell back about 10 positions from their second place starting spot. A few minutes later the 47 would have to head down pit road for a drive-thru penalty, and if that wasn’t bad enough the 37 stopped in turn one just a few minutes later with a loss of power. Jones was able to continue on at full pace without issue, while Mike Lamarra was able to get the 37 fired back up again and rejoin the race. Eight minutes in and the 73 was in 8th, followed by the 52 in 12th, the 37 in 18th and the 47 in 20th. Not exactly what anyone was hoping for. It looked like it might be a long day very early in the event. Whatever happened to the 73 at the start of the race didn’t hurt the car in any way. Jones immediately started charging back toward the front, passing one car after another with relative ease. Just 19 minutes in and Jones had already worked his way back up to fourth. He then came upon the 31 Porsche of Kemp. They had a furious battle for a number of laps which was thrilling to watch. Several times it seemed as if Jones would take the position only for Kemp to pull back ahead. Both drivers kept it clean and eventually Jones was able to take the postion away and set his sights on the leading duo. While Jones continued his march to the front the 52 was doing the same. Jared Salinsky was back with the team this week bringing along Fuse Lenses as sponsor. This was Salinsky’s second start for the team and it seemed as though he had been racing the whole season. Salinsky methodically worked his way forward one position at a time all the while keeping the car clean and in good shape. He definitely seemed more comfortable with the MINI and put in an excellent opening stint. The 37 with Lamarra behind the wheel was also able to bounce back. After losing power and falling back into the field he was able to work his way up to 10th before the rain came. Almost without warning the heavens opened up and the rain began to fall heavily. With everyone still on slicks it was only a matter of time before trouble hit the track. The 75 Audi S3 was the first casualty. First hitting the wall and then having the hood come up and smack the windshield while trying to make their way back to the pits it was the end of the day for them. Almost at the same time the 63 and 65 Porsches hit the wall leading to a full course yellow. Even as cars circled the track under caution the heavy rain was leaving large puddles that were causing a number of cars to spin out. As the lighting began the event was red flagged and the cars would be parked with the clock still running. After roughly 25 minutes under the red flag the field started rolling again under caution. At this point the positions were as follow; the 73 was in 3rd with the 52 in 8th and the 37 in 10th. The 47 was 17th and 1 lap down as they were struggling throughout the day. Next up was pit stops. While the pit stops were clean some positions were lost. The 73 would rejoin in 6th with Mat Pombo behind the wheel. Mark Pombo would take over for Salinsky in the 52 and line up in 13th. Lamarra handed over the wheel to James Vance who would join just behind Mark in 14th. The 47 was the only MINI to gain spots after the pit cycle. They would rejoin in 15th. With 40 minutes to go in the race we would finally return to green flag racing. The Sun was back out and the track was drying quickly. The perceived advantage the MINIs would have in the wet was evaporating away. But as was evidenced earlier in the race, the MINIs were plenty fast in the dry as well. All three MINI JCW Team cars started rocketing through the field, passing one car after another with ease. Mat Pombo was up to 3rd after only a few minutes of green flag racing. With 28 minutes left all three of them were in the top 6, with Mat hounding the race leader. Four minutes later and something truly amazing was happening. Mat had taken over the lead and Mark was following right behind him in second place. Vance who had restarted the race back in 14th had worked his way all the way up to 5th in a masterful run that some him put down some blistering lap times before the yellow flag came out again with 17 minutes to go. With the field bunched up again anything could happen. 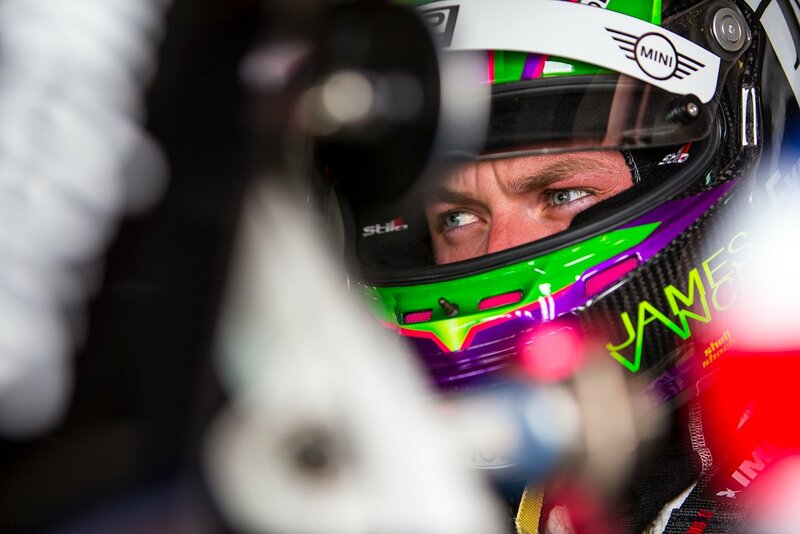 But the MINI JCW Team drivers weren’t about to let this good run get away from them. All three drivers maintained their position until the checked flag waved. The MINI JCW Team scored a one-two finish with the 73 followed by the 52. Vance would come home in 5th making three MINIs in the top five! This was a very successful day for the MINI JCW Team. Jones and Mat Pombo earned the team’s second victory out of four rounds this season. They will move into second place in the drivers standings and are truly championship contenders. 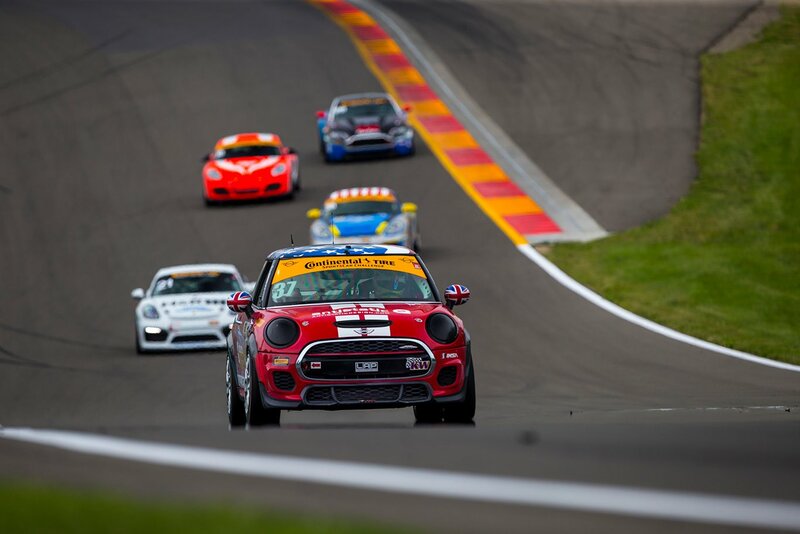 With all three MINI JCW Team cars running so strong the rest of the season is looking really bright and Canadian Tire Motorsport Park (CTMP) can’t get here soon enough. It is truly a great time to be a MINI Race Fan! 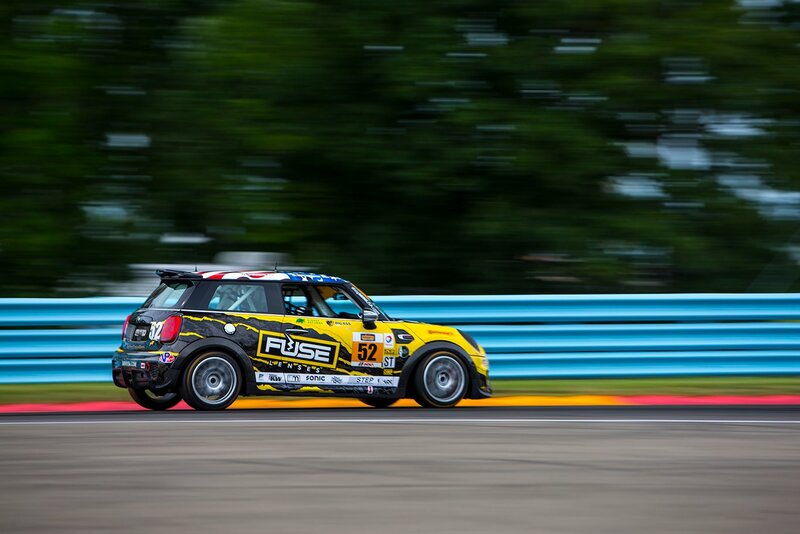 The newest MINI team to enter CTSC, Team Octane, had a rough first outing at Watkins Glen. They were unable to complete the race and finished seven laps down. On the bright side they now have a race under their belt and should know what they need to work on. The team has committed to run two additional events at CTMP and Lime Rock Park. We have high hopes that they can figure things out quickly and compete for victories at these events. July is the busiest month on the calendar in CTSC with three races in four weeks. Next up is Canadian Tire Motorsport Park, where Jones and Pombo had a top five finish last year. Don’t be surprised if they improve on that this time around.